The guest of honour was the Trincomalee Divisional Education Officer, Mr.N.Sandragandan. “But it is disheartening to note that the present day students lack creative and innovative abilities,” she said. “Therefore, it is right and just that the present system of education be changed and be replaced by a system of education catering to form good personalities. Otherwise, they will not be able face the challenges in tomorrow's world." “We grow and always strive to instill the idea of togetherness in learning, with the concern for the students and their total development. The right kind of education will encourage thoughtfulness and consideration for others, " she said. The guests awarded prizes to the best students. 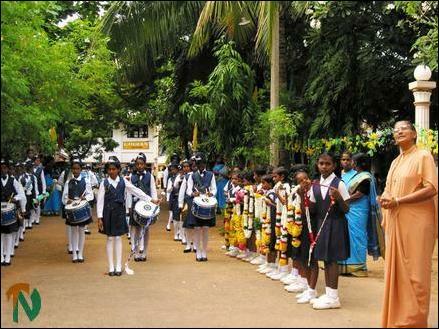 Trincomalee St. Mary's College junior band team awaits the arrival of the guests for their Primary Awards day event with their Principal Rev Sister Therese Ranee ( extreme right) and their teachers Thursday. 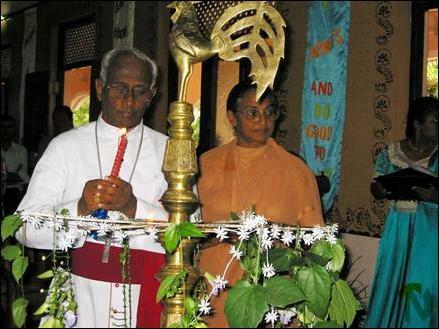 Bishop of Trincomalee-Batticaloa Diocese, Rt. Rev. Dr. Kingsely Swamipillai inaugurating the awards day of Trincomalee St Mary's College celebration by lighting the traditional oil lamp.